With the inner part of the tip, apply naturally as if creating gradation on the lips starting from the inside and working outward. 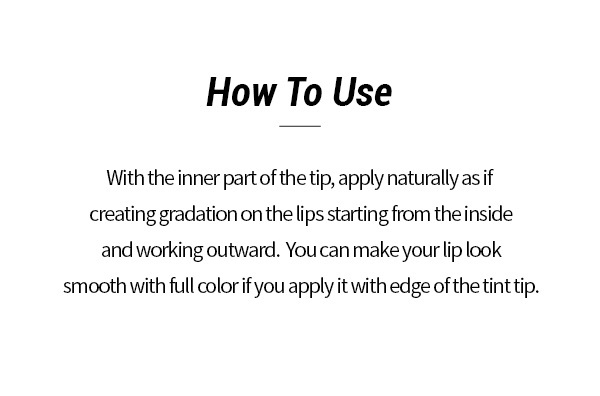 You can make your lip look smooth with full color if you apply it with edge of the tint tip. 1) When using cosmetics or after use, consult with a specialist if there is any abnormal symptom or side effect such as red spot, swelling or itching by direct sunlight. 2) Do not use in wounded areas. B. Keep away from direct sunlight. 4) Do not use in shaking places. 5) Be careful that the tip does not touch the eyeball. 6) Do not modify the tip. 7) Keep the tip clean for future use. 8) Do not use tip with others.